The Darebin Women’s Sports Club continues to pioneer and foster sport run by women for women with the introduction of our latest initiative, the Falcons Academy. Under the tutelage of established AFLW and Club champions, the Falcons Academy will provide an opportunity for girls and women to develop and strengthen the skills and technique required to play Australian Rules Football. As women’s football is growing exponentially, many girls and women who are new to the game are seeking to develop foundation skills. At the other end of the spectrum, girls with solid footy experience are looking for opportunities to take their skills to the next level. Across all levels, the Falcons Academy is designed to enhance the acquisition of football’s core competencies. Our inaugural Falcons Academy program begins Monday 12 November. 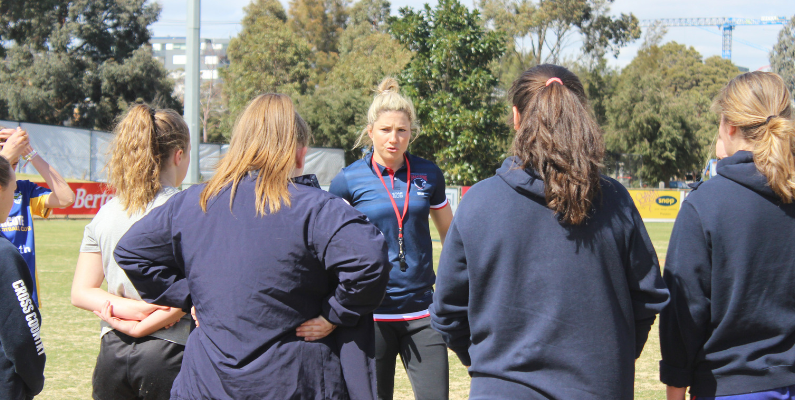 Under Head Academy Coach, Melissa Hickey (Seven-time Darebin premiership player, four-time Victorian state representative, 2017 AFLW All-Australian, Melbourne AFLW 2017 & 2018, Geelong AFLW 2019) girls will receive expert instruction and tutelage over six weekly, one-hour sessions. At the Darebin Falcons, we believe in creating a safe and inclusive sporting environment, which allows girls and women to be the best that they can be both on and off the field. We have a long and proud history of involvement in women’s football, reaching back as far as 1990. From these beginnings, we have grown to become a powerhouse of women’s football in Victoria. Our impact on the AFL Women’s competition and the wider women’s football community is vast. Inspired by this experience and success, the Falcons Academy is designed to pass on our wealth of knowledge to the next generation of footballers.